What is a Bipolar Junction Transistor? The BC547 transistor is an example of a bipolar junction transistor. A bipolar junction transistor, abbreviated BJT, is a type of transistor with three terminals that is made from a doped semiconductor material. A bipolar junction transistor, abbreviated BJT, is a type of transistor with three terminals that is made from a doped semiconductor material. Its primary purpose is for use in electrical devices to amplify or change electrical signals. To understand the bipolar junction transistor, it's best to understand the basic function of transistors and what the terms "doped" and "semiconductor" mean. Transistors simply take an electrical signal that passes through them and either amplify it or alter it. The electrical current enters into the transistor and comes out stronger, thus amplified, when it leaves. 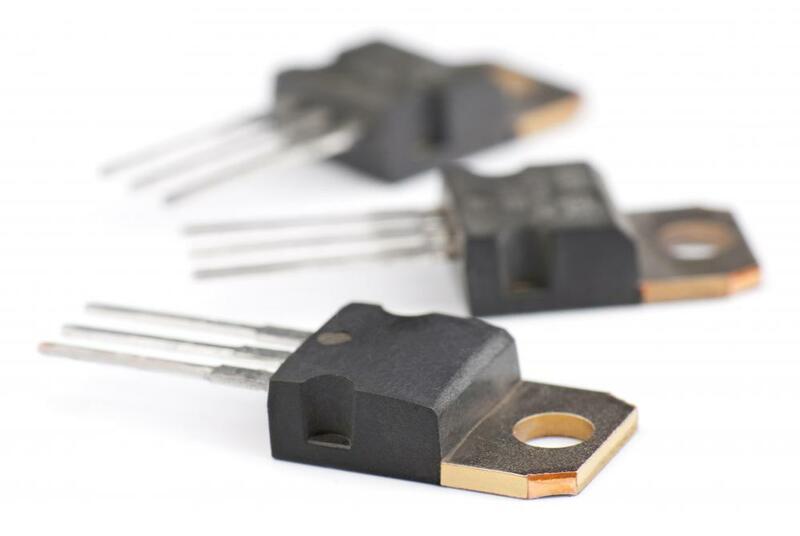 Transistors are one of the basic units that make up all electrical devices and help control and manipulate the electric currents that pass through them. A bipolar junction transistor is simply a specific kind of transistor used to send currents in two different directions. In electronics, the terms “doped” and “semiconductor” refer to specific qualities of transistors. Doped means that the material the transistor is made from is altered slightly to purposefully have imperfections in it. This manipulation of the material alters the charge slightly from the charge it normally carries. Semiconductor material refers to any type of material that can conduct an electrical current but not as strongly as a true conductor. Semiconductors are most commonly used in electronic devices. Bipolar, in the case of the bipolar junction transistor, describes how the transistor uses both electrons and holes to function. When an electrical charge enters the transistor, it spreads out across two areas that carry different charges. One section of the bipolar junction transistor is forward-biased and the other half is reverse-biased. The forward-biased section of the transistor is formed by connecting a type of semiconductor known as a P-type semiconductor to a positive terminal of a battery and connecting another semiconductor known as an N-type semiconductor to the negative battery terminal. To create the reverse-biased section of the transistor, the process is simply reversed so the P-type semiconductor connects to the negative terminal and the N-type semiconductor connects to the positive terminal. These different connections create the two opposite sections inside the transistor. Two common functions for bipolar junction transistors are temperature detection and performing mathematical functions to solve logarithms and anti-logarithms. The ability of the bipolar junction transistor to carry two different currents allows it the flexibility to solve these types of math problems. This property also allows it to detect changes in temperatures by comparing two voltages and calculating the difference. What Is a Battery-Powered Amplifier? What is a Tunnel Junction? What is an Insulated Gate Bipolar Transistor? @miriam98 - I haven’t followed the forums, but I think that the transistor characteristics described here make it clear that there are many applications where bipolar junction transistors could be useful. Basically, any scenario where you need to regulate the current and engage in any sort of decision making to operate a device could use this technology. @Mammmood - Yes, I can see how this is different from a common transistor, which can only alter current but not do any kind of comparison. I’ve also heard that in audio theater systems the bipolar junction transistor is kind of a big deal. Audio fanatics get into debates about which is better, the bipolar junction transistor or the MOSFET transistors, for audio systems. Honestly I couldn’t tell you the difference either way, except that I follow some of the flame wars on the forums. I would guess that the bipolar junction transistor is used in audio because it can compare current and boost audio signals as needed. That’s my uneducated opinion. I work in the computer software industry, and while I don’t do actual computer hardware work myself, I can see practical applications for this kind of silicon transistor. Its ability to compare two different currents means that it can be used in logical processes or math operations. I used to think that all of the mathematical operations in the computer were performed strictly in the integrated circuit chip, inside some kind of mini brain or something. Even if that’s the case, I can see where the transistors that make up the chip play a role in the process. It appears that the bipolar junction transistor can perform math and logic operations because of its ability to compare two different currents. In computers the positive and electrical charges of currents can represent “on” and “off” values, which really is the starting point for all your math and logic operations.